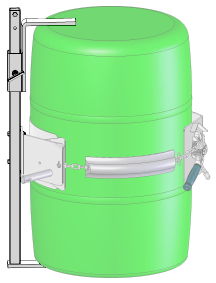 Two-Stage Vertical-Lift Drum Pourers dispense at up to 106" (269 cm) high. Model 510SS-114 shown has air power drum lift and tilt. "More than just a drum dumper. . . 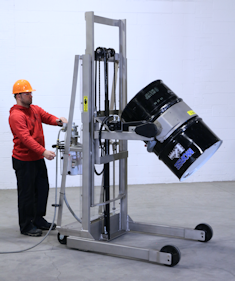 Stainless Steel Vertical-Lift Drum Pourers make it simple to raise and pour a heavy drum. You control the drum pouring angle and height while you dispense. The compact base and quality components of this drum handler make it easy to maneuver. 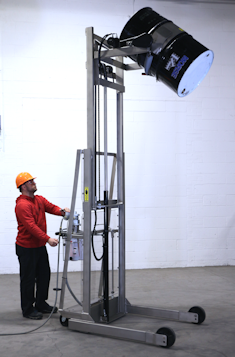 The vertical lifting track keeps the drum reach constant through the full lift range. Pour your drum with a drum faucet or drum cone in place. It is easy to maneuver on two 8" (20.3 cm) front wheels and two rear 6" (15.2 cm) swivel casters. With Scale-Equipped models, you can dispense just the amount you need! The digital scale indicator constantly displays drum weight, even while pouring. 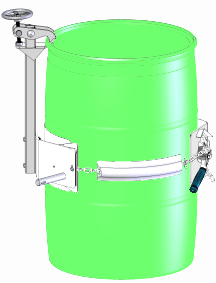 The drum handler's frame is made of finished type 304 stainless steel. The welds are not ground or polished. The ratchet and pawl on the drum holder are not stainless steel, but are coated with FDA compliant powder coat. Gears sprockets and tilt chain are not stainless steel, but have stainless steel guard covers. Two 6" (15.2 cm) swivel casters are steel with polyolefin wheels. See Options Section below for additional stainless steel components. Option "NB" - No Battery. Customer must obtain battery before use... Exide # 27MDP 12V Deep Cycle Battery or equivalent. 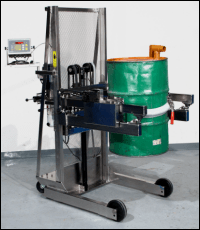 Single-Stage Vertical-Lift Drum Pourers dispense at up to 60" (152 cm) high. Scale-Equipped Model 515SS-N-110 shown has AC power drum lift and tilt. Install the Top Rim Clamp to grip the upper rim of your 55-gallon (210 liter) rimmed plastic or fiber drum to prevent it from slipping through the drum holder. 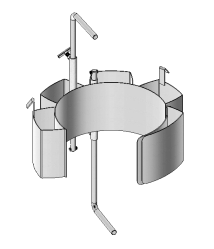 The Top Rim Clamp can also be used with a 55-gallon (210 liter) steel drum. It is permanently bolted onto the MORCINCHTM Drum Holder. Clamp it to the top rim of your drum, then secure the cinch chain around the drum as usual. Adjust for a drum from 31" to 39" (79 to 99 cm) tall. It is permanently bolted onto the MORCINCHTM Drum Holder. For a smaller diameter drum, Diameter Adaptors fit inside the drum holder. They install easily without tools and are quickly removed. Diameter Adaptors for 17.5" (44.5 cm) diameter or smaller have brackets at top and bottom of the drum. They adjust for a drum up to 38" (96.5 cm) tall. The Web Strap has a broad polyester belt that conforms to your drum, and is gentle to the drum finish. To secure the drum, operate ratchet quickly and simply with the large handle for ample leverage. Use the Web Strap and Ratchet to secure your 55-gallon steel drum. Environmentally friendly battery contains no poisonous lead, no acid, and does not create gasses during charge, which regular lead-acid batteries do. 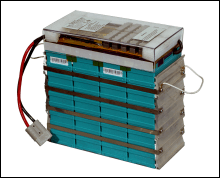 Compared to lead-acid, green battery is super light, has much lower self-discharge, and does not sulfate. Rechargeable 12.8V 100Ah Battery requires no change to lead acid battery charging system. Half-full rating is an indication of capacity for tilting an unbalanced, bottom-heavy drum. Partially full drum with unbalanced and shifting load is harder to tilt than a full drum. Stainless Steel Vertical-Lift Drum Pourers. Stainless Steel Drum lifter on wheels designed to weigh drum while pouring at up to 106" high. More than just a drum dumper. 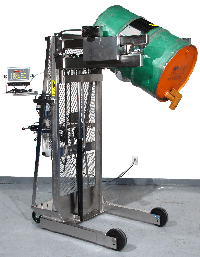 . . provides controlled drum dispensing.